Be the first to share your favorite memory, photo or story of Ginny. This memorial page is dedicated for family, friends and future generations to celebrate the life of their loved one. Ginny Lou Lewis, age 79, passed away Saturday, April 6, 2019 at Caldwell Medical Center. She was a retired Farmers Home Administration Inspector for the U.S. Department of Agriculture. Ginny Lou Lewis was a member of First Baptist Church of Princeton, previously served as the President of the Kentucky Association of County Office Clerical Employees of the USDA Farmers Home Administration as well as the National President of the Clerical Association, a retired volunteer for Caldwell Medical Center, an active member of the Butler Alumni and the number one fan of Jake Lewis. In her spare time she enjoyed gardening, watching western movies and UK basketball. She is survived by her significant other of 23 years, Mike Soltys of Wickliffe, KY; one daughter, Libby Traylor and husband Jerry of Princeton; one son, John Lewis and Martha P'Pool of Caldwell Co., one daughter-in-law, Karen Lewis of Princeton; one brother, Billy Graham McCaslin and wife Nancy of Crittenden Co.; six grandchildren, Bekki Mallory and husband Ryan of Princeton, Logan Miller and husband Corey of Paducah, Jake Lewis of Owensboro KY, Katie Traylor and Anthony Armstrong of Ballard Co., Tonya Cothern and husband Cliff of Bowling Green, KY and Krystal Jones and husband Aaron of Aurora KY; six great-grandchildren; Alayna Grissom, Graham Grissom, Maggie Mullen, Weston Armstrong, Kage Wallace and Tyla Jones. 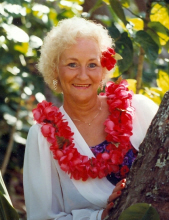 She was preceded in death by her parents William Edward McCaslin and Ruth Elizabeth Graham McCaslin, one son, Bobby Lewis Jr., and one sister, Mary Sue Kukahiko. Memorial Visitation will be held Wednesday, April 10, 2019 at Morgans Funeral Home from 11:00 am to 2:00 pm. Graveside Service to follow at Cedar Hill Cemetery with Bro. Israel Brooks Officiating. To send flowers or a remembrance gift to the family of Ginny Lou Lewis, please visit our Tribute Store. "Email Address" would like to share the life celebration of Ginny Lou Lewis. Click on the "link" to go to share a favorite memory or leave a condolence message for the family.